Capture data anywhere with powerful questionnaire surveys. Get the information you need fast with QuickTapSurvey's intuitive questionnaire tool. No internet needed! Easily collect information on the go from the comfort of your mobile device or tablet. QuickTapSurvey works with iPads, iPhones, and Android devices. Gather information anywhere, even if you don't have a reliable internet connection. Your data will sync automatically when you reconnect to the web. Use our offline questionnaire app to build beautifully branded surveys in minutes. No coding needed! Add your logo, include your brand colors, and more. Easily collect data in different formats with a variety of question types, including sliding scales, matrix fields, multiple choice fields, and signature fields. Create seamless, customized online survey experiences for your users by showing or hiding questions depending on the specific conditions you set. Get the info you need quickly with surveys built for smooth data capture. Custom keyboards and shortcuts make data entry fast, easy, and more accurate. Transform your Apple or Android tablet into a data kiosk while you're at events or out in the field. Set your surveys to auto-pilot, and easily track uptime. Analyze your survey responses as soon as they are collected. Easily generate PDF reports to share with others, or monitor satisfaction with NPS reporting. Inform your team of new submissions or send confirmations to survey takers. Your customized emails will be sent automatically depending on the rules you set. Hundreds of businesses rely on QuickTapSurvey's flexible questionnaire tool to capture vital data quickly and securely. Automate your data capture by connecting your questionnaire surveys to apps like Salesforce, Zapier, and MailChimp. Send submitted information to your G Suite, add new contacts to your email lists, update your CRM with new leads, and much more. Conduct research out in the field with easy-to-use questionnaire surveys, even if you're offline. Monitor customer satisfaction no matter where you are, and enhance your products and services. Quickly capture leads at your event or trade show booth without an expensive lead retrieval unit. Jump in immediately with fully customizable survey templates built just for you. 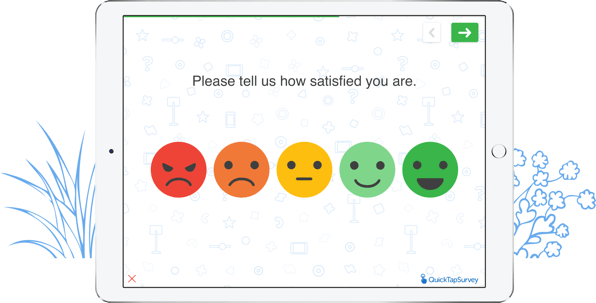 See QuickTapSurvey's questionnaire surveys in action by starting a free trial. No credit card required.